A fun article on rocketbelts, jet packs and the history of personal powered flight using a rocket belt, by Vijay Verghese, and more from Smart Travel Asia, SmartTravelAsia.com and Dancing Wolf Media. Jetpacks, explosions and charred, smoking bottoms. The ultimate high - for 20 seconds. Rocket belts and jetpacks to whisk you away. IT’S AMAZING HOW MONEY can transform your life. If you possessed a truly visionary mind and had US$250,000 to spend on any imaginable goodie, what could you do with it? How might one person help change the world? Think global. Think travel. Think humanity. Think exotic. You could feed all the hungry children in Asia for a year or lend your surname to any orphan left over from the Brangelina adoption rampage in Africa. But there is another option. You could strap a jetpack on your back, hit the button and soar for 20 seconds, perhaps covering a couple of hundred feet – not quite enough to get to the grocery story and really impress your wife, albeit with no change left over the bread. If this event were televised, all the hungry children in Asia would cheer for 20 seconds as you lifted off, performed a u-turn and whizzed back to earth to land on your head with a crashing thump. It certainly beats booking the entire Queen Mary 2 for a week of sun and surf in the Mediterranean while locals eat their hearts out – an ugly sight at best of times. It even beats flying to space with Virgin Galactic which charges from US$200,000 for one ticket (presumably round trip) in three categories – Founders (the first 100), Pioneers (the next 1,000), and Voyagers (those that follow). The fourth class yet to be added is Nuts (pretty much everyone who decides to give up stale fries and a greasy burger at a kiss-all-you-want outdoor movie, to try and watch Ocean’s Thirteen from space). The cheapest space flights may eventually retail at around US$100 per pound (of body fat, tummy lard and baggage) for a brief low earth orbit where you and your impedimenta will be weightless long enough to justify litigation and a full refund on your ticket. For an average 180-pound American male, this works out to US$18,000. Sadly, silverback Gorillas who may wish to view earth from space to peruse possible new gun-free habitats will need to shell out $50,000 for their enormous 500-pound bulk. There’s no denying the lure of rockets. With an inferno of hydrogen peroxide and super-heated steam – that cranks up to a modest 740C – generating vast thrust through blazing jet nozzles just inches from your charred bottom, this sport is almost as safe as, well… leaping off a cliff with your hair on fire. Not quite. I exaggerate. It’s closer to the final scene in any Terminator movie where everything vanishes in a giant fireball. But if you’re a discerning traveller looking for an adrenalin rush and a new way to cover a couple of hundred feet, this may be it. Man has been fascinated by rocket travel since time immemorial. We watched James Bond make his escape strapped to a cool contraption in Thunderball, saw a guy streaking through the skies at the Los Angeles Olympics, and our kids have all read ROCKETMAN comics, marvelling at this super hero’s speed and derring-do and wondering why dad still drives a banged-up Ford to office. 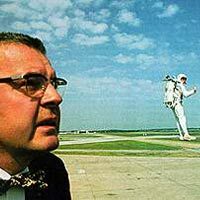 The first recorded rocket belt was created by Wendell Moore of Bell Aerosystems in 1958. 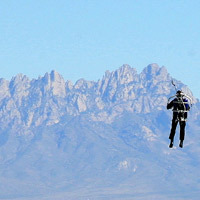 In 1961 the first non-tethered flight was achieved. Harold Graham flew freely for 13 seconds covering 112 feet. The US Army remained keenly interested for a while but later opted for R&D in missile development. This is a shame as human missiles would have been far more interesting than circus cannonball artists and midget-tossing in Australia, a dreadful sport that resulted in countless injuries to throwers who frequently pulled shoulder muscles because midgets are somewhat aerodynamically challenged. 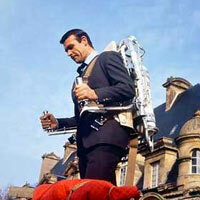 So how do travellers get their very own jetpack and head off to explore the world, 20 seconds at a time? One way is to get a custom-made rocket belt for US$250,000 from inventor Juan Lozano, of Tecnologia Aerospacial Mexicana or TAM (www.tecaeromex.com). The company offers a course that includes 10 flights as well as housing and meals during training. There is no mention of hospitalisation. TAM suggests recouping your investment by rocketing through “special events, promotions, advertising, election campaigns, concerts, TV commercials etc.” Make sure it’s a 20-second TV commercial unless you wish to flame-out in public. Kids will be proud. “Hey, that’s my dad flying through the skies in a blue bunny rabbit suit.” It’s cooler than cool. Once your kids have been ostracised by their peers at school and beaten to pulp, they’ll have no recourse but to focus fully on studies. That's one way to learn math. The other is to flame-out, 100ft above the earth. Another option is a “rocketbelt” from the Rocket Man (www.rocketman.org). Apparently, with a rocket belt strapped on, a skilful pilot can hover motionless like a “hummingbird suspended in midair”. That’s a lot of money to go nowhere but it is thoroughly Zen. Of course you could hover motionless in several stunning locations while your wife screams and tries to call your bank manager to cut you off. 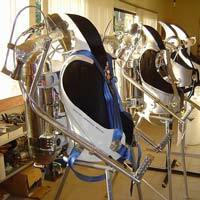 Or try a jetpack from Skywalker Jets. This will enable you to fly a full five minutes. Work is afoot to extend the range and flight time. Now that’s a start. Where’s that bunny rabbit suit?